Susan has had a long history with CSI that first began as a reviewer for the 2nd Edition of the CSI Science Curriculum. From there she was an integral part of the team that developed the resource And It Was Good: Teaching Science from a Christian Worldview (AIWG). Her expertise and training in the Next Generation Science Standards (NGSS) laid the foundation for the AIWG writers to develop excellent model lessons that align with the NGSS performance expectations. Soon after, she was hired on as a specialist to train teachers in understanding and implementing the NGSS, as well as to help the CSI staff launch the Christian School Educators Science Academy (CSESA). Susan currently teaches science and Bible at Avail Academy in Edina, Minnesota. Susan Koppendrayer is a national certified STEM teacher with the National Institute for STEM Education. For several years, Susan has provided numerous seminars for CSI in science education from a biblical perspective. She is a regular speaker at the Heartland Conference in Sioux Center, has conducted multiple one-on-one training sessions with CSI member schools and teachers, and has been one of the primary facilitators for the Christian School Educators Science Academy, working with Van Andel Education Institute to train participants in the NextGen Inquiry Model from a biblical worldview. Many CSI member schools and teachers have benefited from her seminars, training, and inspiration in high quality science education strongly rooted in a biblical foundation. Recently, Susan was able to provide two onsite trainings with CSI member schools in Arizona. 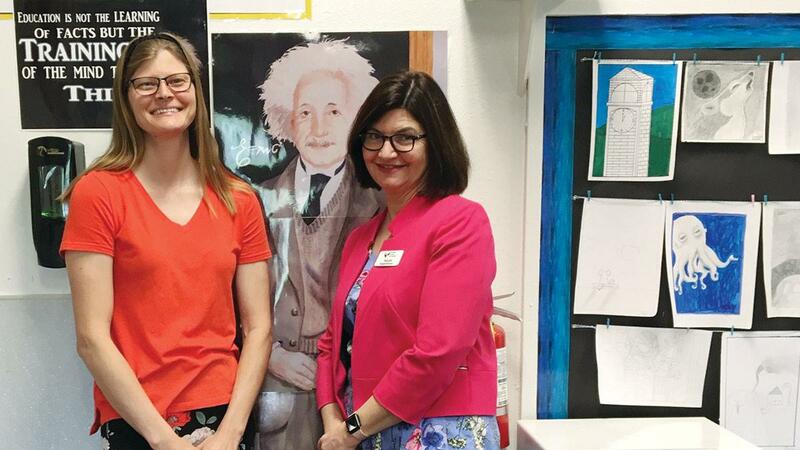 During her visit to Phoenix Christian School in Phoenix, Arizona, Susan listened to students describe their science fair projects, toured the campus with Principal Ryan Groen, and met with K–8 teachers. Susan also provided an after-school science seminar for teachers with help from Phoenix Christian School middle school teacher and CSESA lead teacher, Amanda Ervin. She discussed the importance of science from a biblical perspective and provided a hands-on mini lab that introduced the 5E science instructional model. Later, she traveled to Tucson, Arizona to meet with Principal Aaron Jansen and middle school science teacher Lori Gaither from Desert Christian School. Susan spent the morning answering questions, sharing science resources, and discussing biblical integration in science lessons and units. As Susan has traveled and talked with CSI member school teachers and administrators, she has discovered that there is a great desire to teach science excellently from a Christian perspective, but teachers often wonder “What does that look like?” Susan sees her role as helping connect Christian school teachers to join the discussion and think critically about five things: What is creation saying about God? What does God want us to know about his creation? What does God want us to do with his creation? What is the proper role of science education in God’s creation? What damage is done by separating creator and creation? If you are interested in contacting Susan to learn more about intentionally and purposefully connecting biblical integration with 21st century science content, she can be reached at gro.enilnoisc@reyardneppoks. 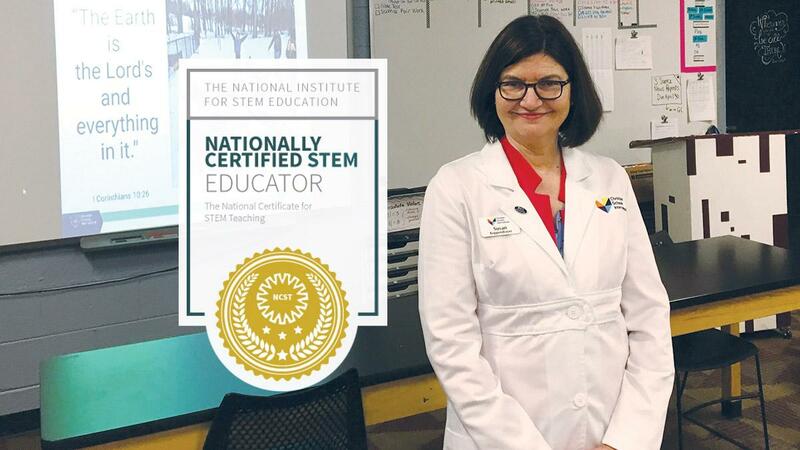 Nationally Certified STEM Educator, Susan Koppendrayer, serves CSI member schools as the CSI STEM Education Specialist via trainings, presentations, and networking events. Susan Koppendrayer and Amanda Ervin, Phoenix Christian Middle School Teacher and Christian School Educators Science Academy Lead Teacher, lead a professional development lab for Phoenix Christian School teachers in Phoenix, Arizona. 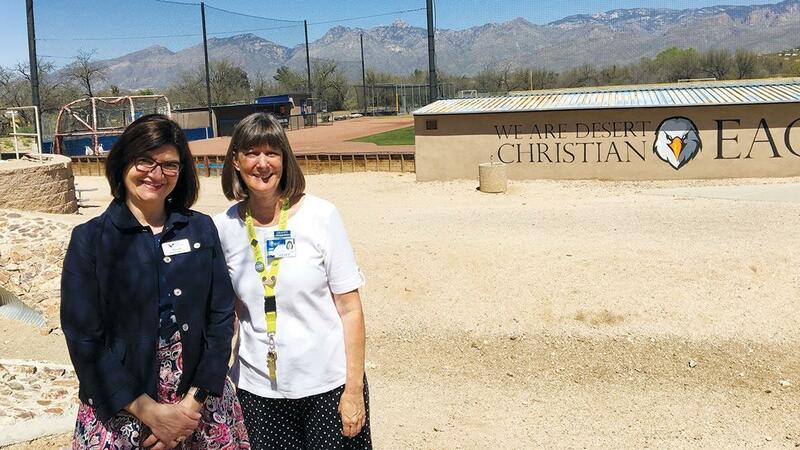 Susan Koppendrayer meets with Lori Gaither from Desert Christian School in Tucson, Arizona to share resources and discuss best practices for biblical worldview integration in the science classroom.